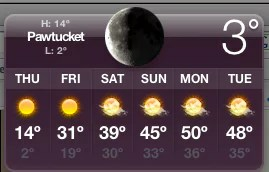 That’s the temp as of right now at 11:24 pm. Supposed to go down one more degree. Or maybe it’s gone up? Up yes. Please, we must be positive now. Warmer weather expected this weekend… like a cold Monterey night in the 50’s. Now that I can handle. Liquid warmth awaits in a swig of whiskey. Ta for now. From 14 to 50 for daytime highs! That’s quite a swing. Wow!